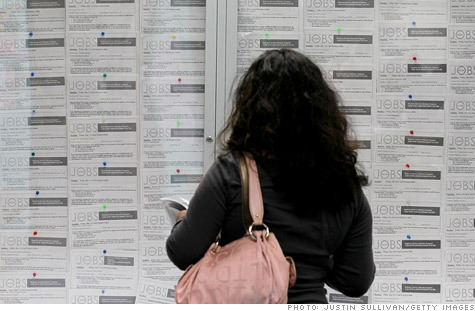 NEW YORK (CNNMoney.com) -- More Americans than ever before feel they have no hope of finding a job. A record 1.21 million people want to work, but said they aren't looking because of the weak labor market, according to federal statistics released Friday. The June figure is up from 793,000 a year ago. The statistic is yet another sign of how bleak the employment picture is. And these folks, known as "discouraged workers," aren't even counted in the unemployment rate because they haven't looked for work in the past four weeks. Unlike those who have given up completely, discouraged workers have hunted for a job during the past year. Still, there's not much hope out there for this segment of the unemployed. There are five workers for every available opening. "Things are very, very weak and they are not expected to strengthen anytime soon. It's going to be a long slog," said Heidi Shierholz, a labor economist at the Economic Policy Institute, a left-leaning group. Shierholz expects the unemployment rate, now at 9.5%, to hover around 10% through early next year. Those who have been out of work for a long time will find it more difficult to land a new job, particularly if they are in sectors that will likely remain depressed, such as manufacturing and construction. They don't have the skills to switch industries. "They stay unemployed because there's no fit," said Lakshman Achuthan, managing director of Economic Cycle Research Institute. The labor force, in general, has shrunk over the past two months, contracting by 974,000 people as they lost confidence in their employment prospects. That reverses part of the gain of 1.7 million workers in the first four months of 2010, when a wave of optimism flowed through the nation. More people may have stopped looking for work because their jobless benefits are expiring, wrote Deutsche Bank economists Joseph LaVorgna and Carl Riccadonna in a note. To collect unemployment benefits, people must be actively seeking work. As the labor force contracts, the unemployment rate falls. This is one reason why it dropped in June from 9.7% the month before. "The decline in the unemployment rate is not a reflection of strength, but rather a sign of discouragement among the ranks of the unemployed," the economists said.